It’s so easy to make your own croutons! 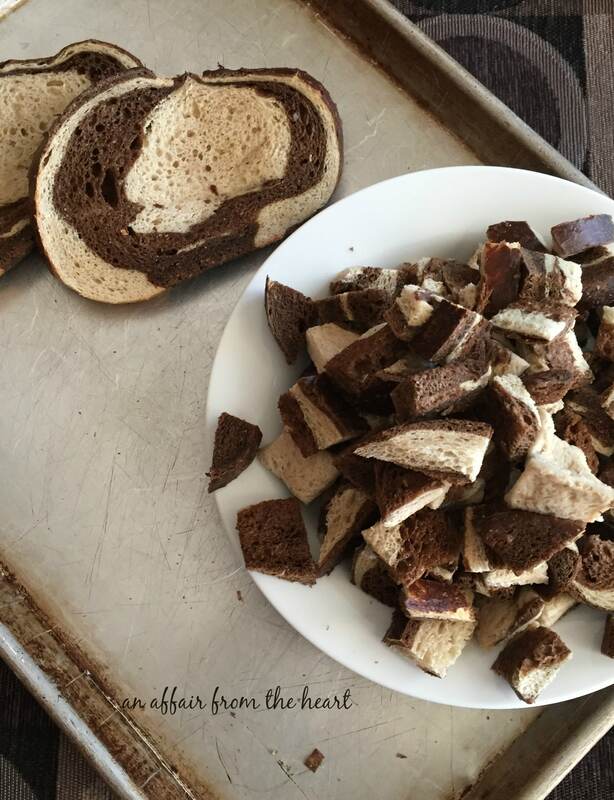 These are made with bakery rye bread, and were perfect on soup and salad. 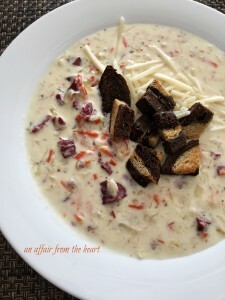 I made Cream of Reuben Soup the other day, and in my opinion, you can’t have a Reuben without rye bread. Am I right? 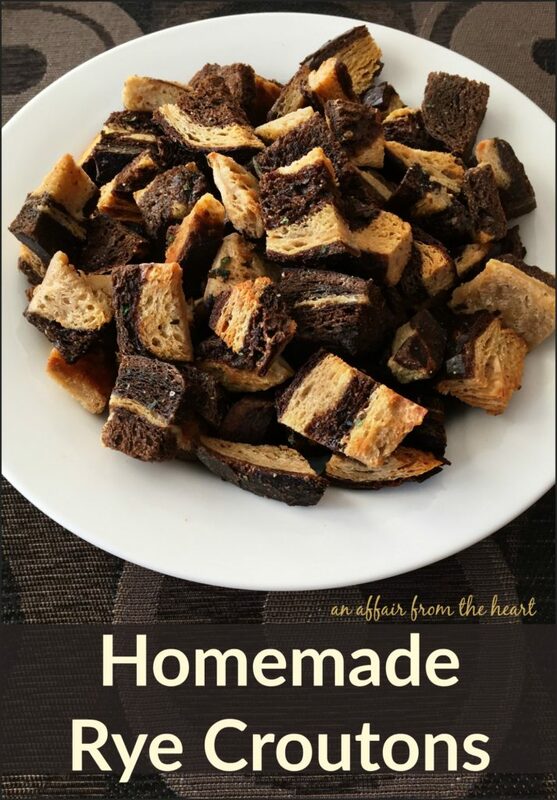 I decided to whip up some homemade rye croutons to top off our bowls of soup. You could use this method with any sort of bread, really. I used a bakery marbled rye. You want your bread to be a bit stale. I left my bread bag open over night, to dry it out a bit. A light sprinkling of melted butter, seasoning and salt, a few minutes in the oven and you have perfect croutons. Crispy on the outside and soft on the inside. Have you ever been to Ruby Tuesdays? Their salad bar is amazing, and my favorite part of it is their croutons. 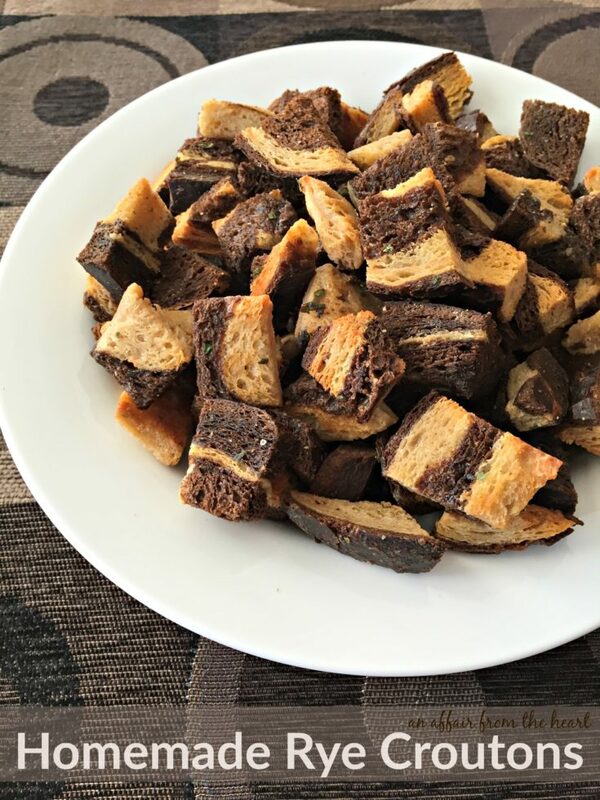 My family thought these croutons were VERY similar to theirs. The perfect crouton. Golden brown on the outside, but still soft in the middle. Seasoned just how you like them! Preheat oven to 375 degrees. Spritz a cookie sheet with spray butter, or rub with a stick of butter to coat. Cut slices of bread into the size of croutons you desire. I left the crusts on. Lay bread on prepared cookie sheet in a single layer. Melt butter and whisk in garlic and oregano. Drizzle over the top of the bread. Bake for 5 minutes, turn bread over. Continue this method every 5 minutes until bread is toasted to your desired crispness. I like mine golden brown on the outside and still soft in the middle. Mine took just under 20 minutes. Watch them closely. Sprinkle with sea salt when you remove them from the oven. Let cool. Store in an air tight container. Use within one week. Feel free to use any bread you like. Change up the seasonings to your liking. Other seasoning ideas: basil, thyme, fresh herb mixture, parmesan cheese.